NASA's Spirit rover has encountered boulder-strewn slopes, where it's scouting out potential winter locations within driving distance. Getting there will take some careful navigating, however, since many of the slopes leading down from the top of "Home Plate" are too steep for the rover to cross safely with its dragging right front wheel. The MarsExploration Rovers have weathered two drab winters on the Martian surface, andmission managers are already looking ahead to yet a third chilly season. Allthis from a mission that was only designed to last 90 days. The Spiritrover is searching for a spot to stick it out during the upcoming Martianwinter, which will last from March 2008 through October 2008, according toa statement from NASA's Jet Propulsion Laboratory in Pasadena, Calif.
AlthoughMars has a tilt similar to Earth's, Martian seasons last longer because theplanet takes almost twice as long to circle the Sun—almost 687 Earth days. "Whenyou're talking about the rovers surviving winter on Mars, planning many monthsin the future is really important," said Steve Squyres, principal scientist of the MarsExploration Rover team at Cornell University in Ithaca, New York. "Butit's too soon to tell where we might situate them." Thesolar-powered robots take an energy hit during the dim conditions, Squyresexplained. "Thesun gets very low in the sky, giving us a lot less solar power to workwith," Squyres said. Fewer gusts of wind are around to clean dust from therovers' solar panels gathered during recent dust storms,he added, which compounds the problem. So how dothe rovers survive the winter while still doing plentyof science, as they did in 2004 and 2006? "Wetry and park them on a broad, north-facing slope that helps them gather moresunlight," Squyres said. Scientists not only prefer a good slope, but alarge and scientifically interesting one. "During the winter, it'sessentially science on a hill," Squyres said. "If we're stuck on asmall slope, we're much more limited in what we can investigate." Even if arover gets "stranded" on a tiny hill, however, it's not necessarilythe end of the world. "Beingstuck in one place allows us to do science we normally can't because we're in ahurry, driving the rovers around," he said. "It also allows us tointensively study a single, small area, like landers do." 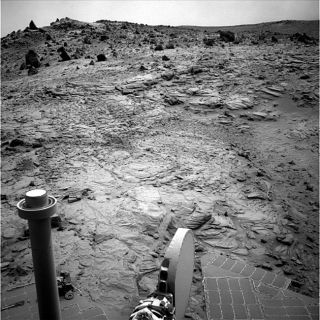 During thelast winter, Squyres said, Spiritstudied a palm-sized area of Martian soil for months. "It'sprobably the best-studied patch of dirt in the solar system beyond Earth,"he said. AlthoughSquyres said the rovers have led impressively long lives to this point—each nowmore than 1,324 Earth-days beyond their warranty—he said it's impossible topredict their abilityto survive. "Theirlong lives are experiments in progress," Squyres said. "They coulddie three years from now, or in the next hour. There's simply no way for us toknow, so we're trying to do as much as we can with what time we might haveleft."